Welcome to my CDF/Cal Fire Registry History Page. My name is Henry VanderLeest , and this is a short Historical perspective of my time with the organization. My Training, Assignments, Calls, Incidents and Adventures that I recall as vivid memories. My co-workers and friends often called me Radio Tech . 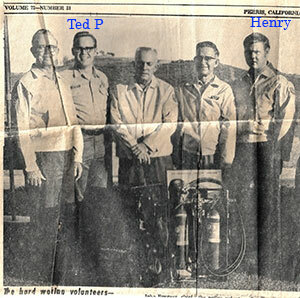 Quail Valley Station 5 Volunteer Above is photo with several volunteers including Ted P., Relief Engineer. Seems I have come full circle. Even though my entire career was not CDF, Glen considers any contribution a worthwhile under taking. Soo, Glen, thanks for the encouragement ! My experience with the CDF begins in 1970 as a volunteer firefighter at Quail Valley Station 5. The Captain then Was Bill Merriken, who was soon succeeded by Bill Keen. For 3 years as I rambled my way thru High School I responded to Fires, Medical Aids and some of the most gruesome Automobile Accidents I have ever seen. I suppose when your helping at first hand it’s much more intensive. After High School I drifted away from CDF, but found them again when I became Employed with the County of Riverside as a Radio Technician in 1982. About 1984 or 85 the county got the County Fire contract to repair radios on county fire trucks and other mobile equipment. It was baptism by fire as I learned first hand about GE 3 Button and 4 Button Fire Truck radios. The contract only lasted for a year, but I had acquired first hand knowledge on how CDF handled its radio communications. By the way, if you can remember GE 3 or 4 button radios, your as old as dirt! In 1989 I became employed by DGS Telecommunication for the State of California, and toured the entire State of California installing CDF, Caltrans and CHP Mountain Top Radios, Repeaters and Microwave towers. During that first ear I saw more places, mountain tops and state facilities than I cared to know existed. My immediate Supervisor was Gary Spronz, and he knew how to get a job done right. During that time I became acquainted with Don Holt at Perris CDF, Tom Greenwood at San Bernardino CDF. 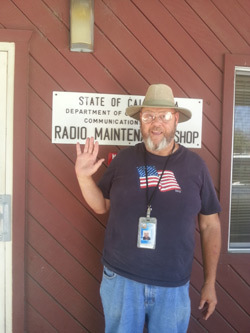 All great things come to an end and in 1990 I was permanently installed at the San Bernardino Radio Shop where it seemed it was a daily experience to maintan those old Moducom Consoles at San Bernardino and Perris CDF.